Cheaper by the Dozen and Belles on their Toes proved such popular books that they were adapted for film. Like most movie adaptations, they don't include all the wonderful scenes of the books, so if you haven't yet read the books, you'll want to! The movies are hard to find in video rental stores, but you can frequently catch them on Cable TV on the American Movie Classics (AMC) channel. Sometimes you will find a copy for sale on one of the internet auction sites. Cheaper, the movie, is narrated by the Anne character, while interestingly, the books are really the voice of the Frank and Ernestine! 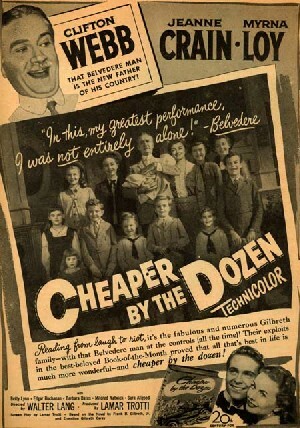 Cheaper by the Dozen was directed by Walter Lang and produced in 1950 by 20th Century Fox. The movie featured several big-name entertainers, including Clifton Webb as the father, Frank Bunker Gilbreth and Myrna Loy as Lillian Moller Gilbreth. Jeanne Crain played daughter Anne, the eldest of the children. Read more about the movie on the Internet Movie Database. Belles on their Toes appeared two years later, in 1952, and was directed by Henry Levin and produced by 20th Century Fox. Myrna Loy and Jeanne Crain were back for the sequel, which featured several other well-known actors, including Debra Paget as Martha, Hoagy Carmichael as Tom Bracken. Read more about the movie and cast on the Internet Movie Database. Actress Jeanne Crain (who played Anne) appeared in advertisements, such as this one for RC Cola, which capitalized on the film's popularity. This site, about actor Martin Milner, contains some movie stills from Belles.